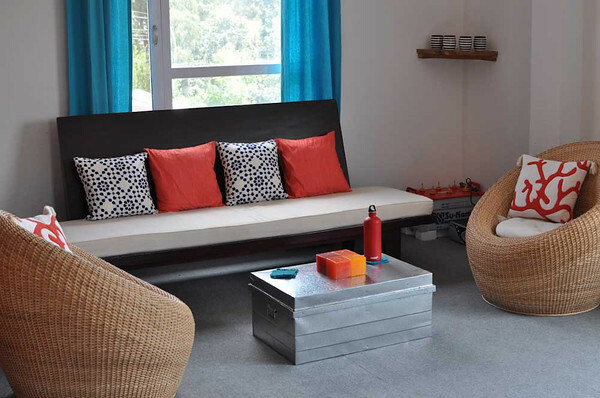 Our favorite bloggers in all of Nepal (okay, actually we refer to them as our blogging soul mates) asked us recently to help out with some suggestions for their new digs. You can read about how they got to Kathmandu here. You can read about their apartment here, here and here. You can read their latest design query here, which ends with a Phone-A-Friend to us! To summarize, the Kathmanduo (aka Brian and Claudine) are trying to figure out how to finish their main living area. Specifically, they’re still looking for a desk and dining room table/chairs. We love the coffee table (keep it! and maybe add some nesting tables to the sides of the sofa?) and adore the chairs. Let's be honest, we think they've done an amazing job, especially considering they can't hop in the ole' SUV and run to Target. Hope you don't mind that we used one of your gorgeous photos! First of all, we LOVE the colors you’ve chosen. Any variation of blue and orange is the way to Deweese’s heart. Check out her new bedroom pillowcases. Sorry, back to Brian and Claudine. We have to admit, the Kathmandu shopping scene is a little out of our realm of expertise, but then again, most things are. We were surprised to find out that wood items are much more expensive in Kathmandu, and that if you decide to have some pieces custom made, they will likely need to be metal. The living room is already nicely layered with wood/metal and round/straight lines equaling total bliss in our minds. We think you really can’t go wrong by adding in some custom-made metal pieces. For some ideas, we started with one of our faves, the go-cart desk from CB2. We love that it has wheels, so you can move it around and make it work for you in other areas of the house too. B+C What do you think? Could you double-time it and use it as a desk too? Maybe pull it in the kitchen for extra cookin’ space as needed. 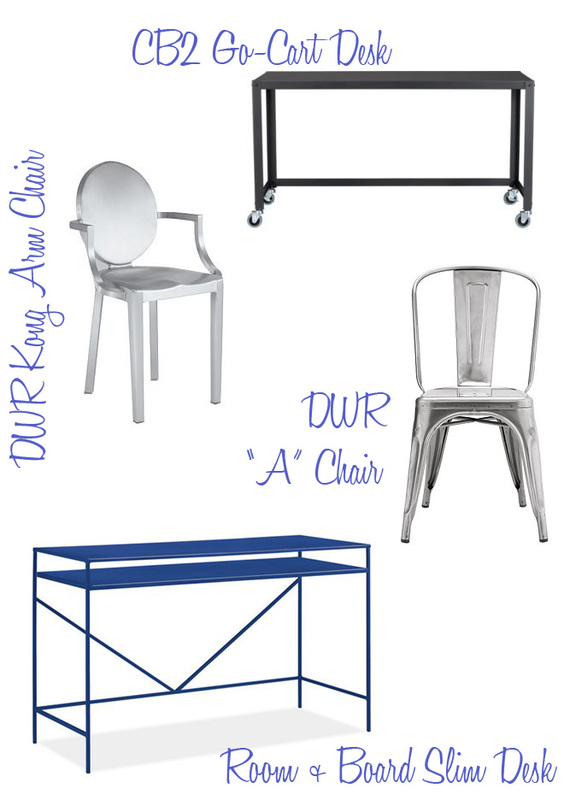 We love metal chairs too and there are tons out there to choose from/replicate. But maybe you can find several styles that you like and mix + match to get a more eclectic/collected vibe. You can throw some colorful seat cushions on to soften them up too. And we're dying over the blue painted metal table from Room + Board. Here’s another thought… how do you feel about the “Industrial” look? 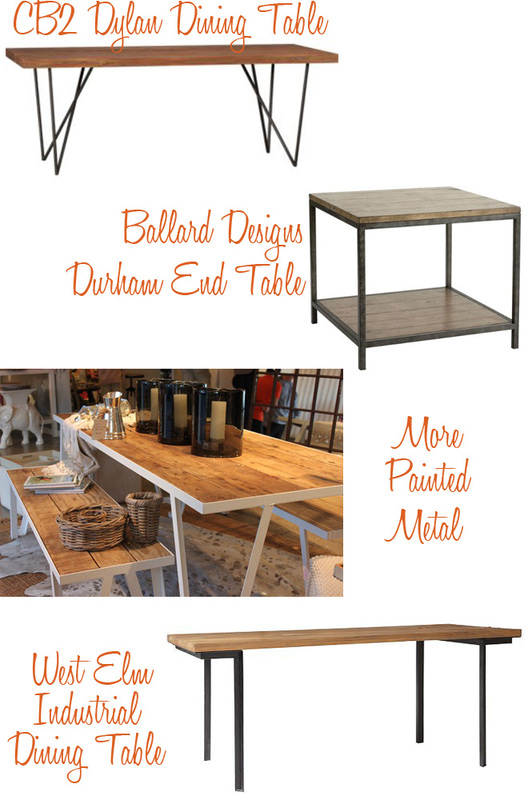 We’re loving how many new collections these days are mixing metal and wood. Here are some examples. Hope we’ve been helpful in some way. Keep updating us with gorgeous pics of your lovely apartment. We’re always talking about how we’re gonna come to Kathmandu for a 75th + Sedgwick field trip! 75th and Sedgwick, you outdid yourselves! We love the desks and tables that you found -- in particular the Room and Board Slim Desk (great color pop!) and the CB2 Dylan Dining Table. These will serve as great inspiration if and when we finally bite the bullet and decide to get a couple things made. We will keep you posted! Oh, yay. So glad that you like the ideas! The Room and Board has a whole "Slim" Collection of lots of great metal pieces that would be presumably easy to recreate...? Please keep us posted, we'd love to see what you end up going with It's just another reason to live vicariously through you, since the idea of custom furniture kind of makes our heart melt.